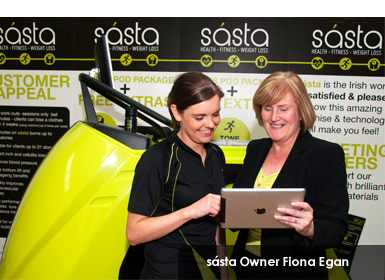 FE: It was both a very busy and challenging year for såsta fitness franchise. FE: The main challenge was financial as the Irish banking lending situation is still not conducive to startups despite what the media may have to report. IFM: What opportunities have you identified for 2015? FE: In 2015, we are looking at research and development on a new product range and also concentration on following up on International enquiries. FE: We currently have seven locations, of which two are company-owned. IFM: What level of expansion did you achieve in 2014, both nationally and internationally? IFM: What are your expansion plans for 2015? FE: In 2015, we are looking at increasing our franchised locations to 12 and to enter the US market by the end of the year. 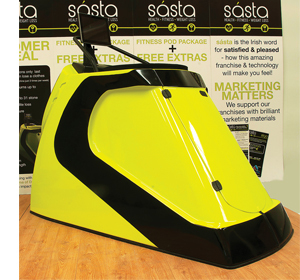 FE: Our business is unique due to having the sole use of our patented sásta fitness pod. The short 30-minute walk or run in the sásta pod is achieving results much faster than regular exercise and is very appealing to busy people. IFM: How do you keep your clients motivated to continue with their fitness regime after the initial motivation of the New Year has worn off? FE: The fact that clients achieve results within two weeks (using the sásta pod three times per week for 30 minutes), coupled with the motivation from our one-to-one personal trainers keeps clients on track to achieve their goals after the New Year resolutions have waned. IFM: Are you seeing an increase in fitness level within this sector, and if so why do you think this is? FE: On average, a client would increase their fitness levels between 10 per cent and 20 per cent in the first month at såsta fitness. This is solely due to the use of our unique sásta pod. FE: Choosing a franchise provides an entrepreneur with a turnkey business model with the added support from the franchisor to grow a successful business, with the advantage that the corporate image and brand awareness is already recognised. FE: I chose the franchising model as it was the best method to prove the sásta fitness concept and to enable growth in a uniform fashion. IFM: Have you made any changes to your business strategy according to trends in the market, and if so how does this impact on training schedule for existing franchise owners? FE: A new trend we are seeing is that people are more concerned with being healthy and improving their fitness levels, recognising that exercise is key. Media attention to our obesity epidemic is making people take action resulting in good food choices over fad diets thus sustaining weight loss. We provide a tailored meal plan as part of our package offering concentrating on educating people on healthy food choices and making it simple with easy to make recipes for all occasions.